Lawn mowing, edging, hedge trimming, leaf removal, spring & fall clean-ups to keep your property perfectly manicured! Professionally built and installed hardspaces, retaining walls, landscape lighting and sod installations. From seasonal trimming to tree and shrub removal we have you covered! Snow plowing services and useful de-icing agents that won't eat away at your sidewalk and driveways. From Holiday lighting to spring and fall clean-up, seasonal packages are available! Lawn fertilization & weed control services to jump start and keep your lawn healthy throughout the year. Core aeration, slit seeding, de-thatching. Just a few of the services the pros use to keep your property beautiful. 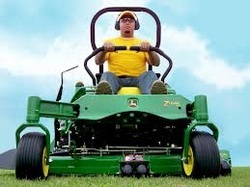 Grub's Lawn Service is a family owned and operated business that takes great pride in servicing our customers. With professional technicians and staff we can help you with all your Lawn Care, Tree & Shrub Care as well as your Pest Control & Termite Control needs. With our friendly, professional employees and our simple promise of 100% guarantee you have nothing to fear. Plus you can receive 1 application free, then just refer friends and neighbors each month for even more savings. You receive $25 for each referral that signs up and becomes a customer, also receives a $25 credit off their first service.